True makes for short virtue name with a cool, modern sound. What’s not to love? 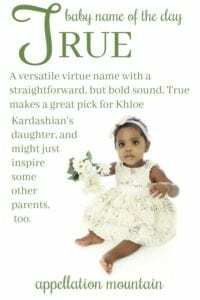 Thanks to Aurelia for suggesting our Baby Name of the Day, and to Khloe Kardashian for putting it back in the headlines. Some virtue names – modern and traditional – feel narrow. Patience isn’t always the most desirable approach. Valor might feel a little bit aggressive. But then there are the virtues that seem more expansive. Honor is a universal good. And True, in any of its forms, likewise seems unambiguously positive. Look it up in a thesaurus, and the words that come up are faithful, trustworthy, constant, honest, steady. In Old English, the word was triewe or treowe, and similar words are found in other languages. Interestingly, our word tree shares some of the same origins. It’s associated with dozens of appealing phrases and ideas. We’ve been falling in treowlufu – true love – since Old English was the language of the day. The phrase “true north” was first used in the sixteenth century. “True blue” dates to the eighteenth, and dreams have “come true” since the nineteenth century. This element appears in plenty of surnames, like Truitt and Truman. The Tru- doesn’t always come from the virtue. Still, the sound is unmistakable, and plenty of parents have probably been drawn to the names for the positive association. As a given name, this choice has long seen some sparing use for girls and boys, at least since the nineteenth century, and might be older still. We know that Truth and Verity were used by the Puritan settlers in the New World. True – 31 girls and 44 boys were given the name True in 2016, down slightly from 2012’s peak of 45 girls and 53 boys. Truth – Truth reached a new high for boys in 2016 – 51 boys. 23 girls called Truth were born that same year. Truly – Seven girls received the name in 2000; by 2016, that number was 44. A handful of girls also answer to Truely, the spelling chosen by another reality show family on Sister Wives. Truman – Presidential Truman comes from trow – a Middle English word meaning faithful, forerunner of our word true. It has appeared in the US Top 1000 previously, but falls just outside as of 2016. There’s also Gertrude, a vintage name that remains little used today, and nickname Trudy or Trudie, which seem rich with potential in our age of Sadie and Hattie. Another popular form? Tru, hold the ‘e’. This spelling was given to 31 girls and 80 boys in 2016, but was used for 125 girls back in 2004. Why? Short-lived Fox series Tru Calling, starring Buffy the Vampire Slayer alum Eliza Dushku, ran for two seasons between 2003 and 2005. Dushku wore another virtuous, short name during her time on Buffy. She played a vampire slayer called Faith. Khloe Kardashian and Tristan Thompson welcomed daughter True in April 2018. The reality star chose a name that feels right at home among the current generation: Rob’s Dream, Kim’s Saint and North, and Kourtney’s Reign. Kardashian matriach Kris revealed a twist: not only is this an appealing word name that fits their family’s signature style, it’s an actual family name. 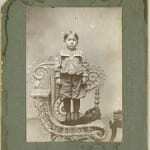 Kris’ grandfather was born True Otis Houghton, and her dad was Robert True. That makes little Miss Thompson the third generation to answer to the virtue name. It will be months before we know if this high-profile birth announcement influences parents, but it seems possible. Not only is this name virtuous, it’s also versatile. It feels like a possible first name, especially given our affection for single-syllable names for boys and girls. Or it could be a great, bold middle name choice, again for either gender. If you’re looking for a modern virtue name that feels bold and tailored at once, True could be the name for you. What do you think of True? And do you like this name better for a boy or a girl, or do you think it is truly gender neutral? This post was originally published on May 7, 2015. It was revised substantially and re-published on April 16, 2018. Abby, did you read Kris Jenner’s comments on Khloe’s name choice? Her father and grandfather have True in their names, so it’s a family name too! Now I like it even more! Dr Dre has a daughter named Truly. Which I prefer for a girl. When I hear this name, the lyrics “Love me tender; love me true…” come to mind. Since the king of rock and roll was the original voice behind the words, it’s easy to imagine him singing to his sweetheart, “Love me tender; love me, True…” almost as a plea to a girl named True. It’d be neat to name a little lady Verity but have her nickname be True. I can’t believe I actually really like a Kardashian name! And it’s a rare name that I think works equally well for either gender. My dad grew up with a Truly. Her parents were adventurous namers, she also had a sister named Tuesday and a sister named Velvet. I like both Truly and Tuesday, but not Velvet. The poster who knows a Trueheart — wow! I love it! Especially in the middle slot. I also know a Truax, which I don’t know where it derives from, but it’s very unique! I named my son True. I got many different reactions when I first decided upon the name, but I dismissed all the negative, small brained opinions and stuck with this beautiful name. He is going to be 12 this year, and I am so proud of him for being True. So perfectly True. I know of a little girl named Trueheart who goes by True. It’s a family name (I think Trueheart was the surname of a grandparent). It’s a really adventurous name! I wouldn’t be bold enough to use it but I really like it. Truett, not so much. I like it especially as a middle. I am not sure I would use it in first position, but I wouldn’t be bothered if someone else did.